Thank you everyone for your wishes for my birthday yesterday, both on here, facebook and by email! I felt very loved! 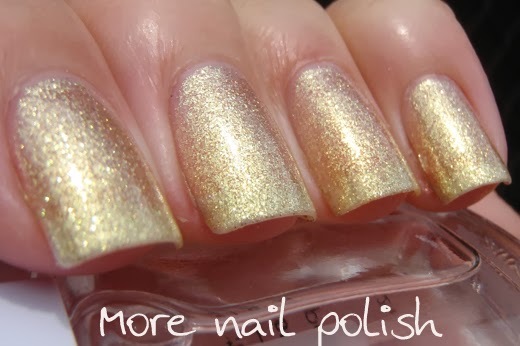 Following my gold mani yesterday, it seems like a perfect time to reveal all the gold polishes from my guess that gold giveaway. There weren't a huge number of entries, but the girls who did respond sure did put a lot of effort in. Unfortunately there were just a few too many entries for me to be able to post something to everyone that tried. Combining all the entries, every single polish brand was correctly identified against the right polish, and only one polish name was not guessed by anyone. 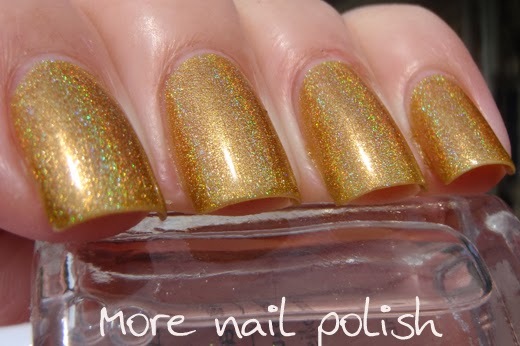 I'm not at all surprised that no one guessed the polish name for #18, which was my vintage polish from the 1990's. I've detailed next to each polish name, the percentage of people that guessed it correctly. So lets have a look again. #1 China Glaze - Passion - 20% correct on brand. 20% correct on polish name. #2 a England - Holy Grail new - 67% correct on brand. 67% correct on polish name. 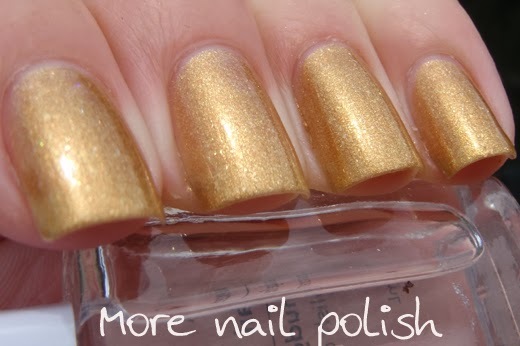 #3 OPI - Golden Eye - 67% correct on brand. 67% correct on polish name. #4 Chanel - Peridot- 60% correct on brand. 60% correct on polish name. #5 aEngland - And the Moonbeams - 47% correct on brand. 47% correct on polish name. #6 Urban Decay - Twisted - 53% correct on brand. 53% correct on polish name. 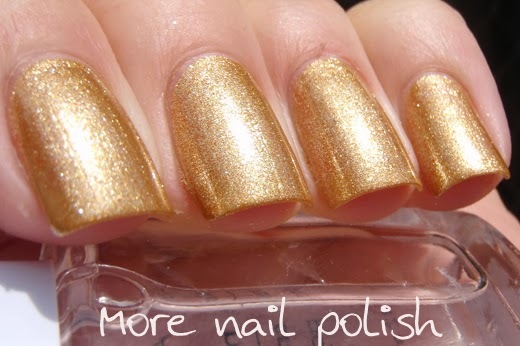 #7 Barry M - Gold - 13% correct on brand. 13% correct on polish name. #8 Pretty Serious - Mummy Mush - 60% correct on brand. 60% correct on polish name. #9 Priti NYC - Chrysanthos - 27% correct on brand. 27% correct on polish name. #10 Zoya - Kerry - 47% correct on brand. 33% correct on polish name. #11 Emily de Molly - High Distinction - 80% correct on brand. 80% correct on polish name. 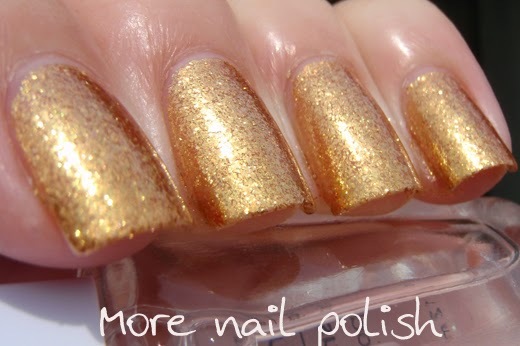 #12 Essie - Good as Gold - 27% correct on brand. 27% correct on polish name. #13 Ulta 3 - Precious - 53% correct on brand. 53% correct on polish name. #14 Milani - 3D - 60% correct on brand. 60% correct on polish name. #15 TBN - Gilt - 20% correct on brand. 20% correct on polish name. 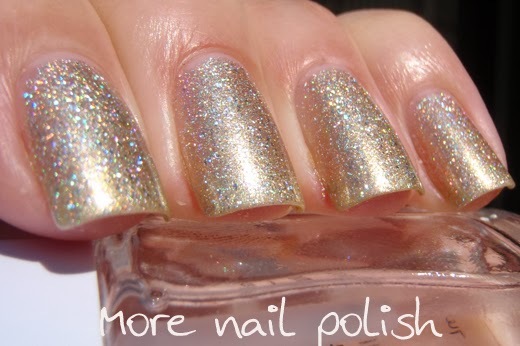 #16 Picture Polish - Majesty - 47% correct on brand. 47% correct on polish name. #17 Cover Girl - Bronze Beauty - 20% correct on brand. 7% correct on polish name. #18 Revlon - Solar - 7% correct on brand. 0% correct on polish name. #19 Jessica - Palladium - 53% correct on brand. 53% correct on polish name. #20 OPI - Honey Ryder - 73% correct on brand. 73% correct on polish name. #21 Perpera - Crystal Gold - 20% correct on brand. 20% correct on polish name. #22 Jade - Mystic Gold - 73% correct on brand. 73% correct on polish name. 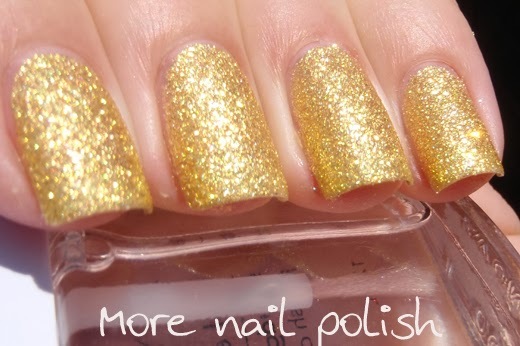 #23 Glitter Gal - Yellow Gold sparkle - 73% correct on brand. 73% correct on polish name. #24 BYS - Metallic Angel - 33% correct on brand. 33% correct on polish name. 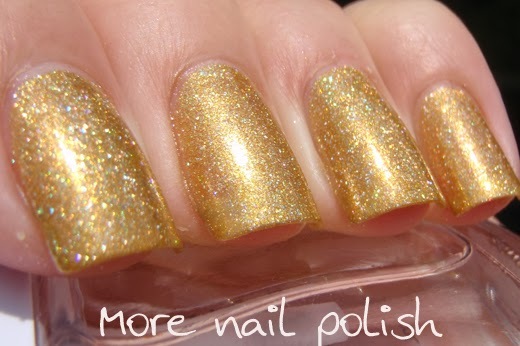 #25 OPI - I get a kick out of gold - 13% correct on brand. 13% correct on polish name. #26 Zoya - Solange- 80% correct on brand. 80% correct on polish name. #27 Ozotic- 604 - 67% correct on brand. 67% correct on polish name. #28Orly - Luxe - 20% correct on brand. 20% correct on polish name. #29 Zoya - Ziv - 60% correct on brand. 60% correct on polish name. #30 Enchanted Polish - Austin Powers - 80% correct on brand. 80% correct on polish name. What was also really interesting to look at, was how many correct polishes were identified overall, but placed against the wrong polish. For example, one entrant got 14/60 correct, but when you look at all the polishes and names correctly identified, but in the wrong place, she actually guessed 34. The most that were correctly identified overall, including ones in the wrong place was 52. I have emailed all the above prize winners with details of their prizes. Thank you to everyone who participated. I'll try make the next one a little easier with less polishes in the colour group. how did i miss this epic game?????????????? I wondered if I should have promoted this on AN, then you wouldn't yVe missed it. Plus I kept forgetting to remind people it was on too. Sorry babe! I haven't got any of the polishes in the prize pool, so whatever will be sent to me I will cherish dearly. Again, great job Cathy and I'm looking forward to the next challenge! Thanks Yuri, I'm so glad your excited to receive one of the random draw prizes! Congratulations to all the participants and of course the winners. I didn't even try to identify these polishes - much as I love them all. It was way out of my league even though I loved the concept of the game. 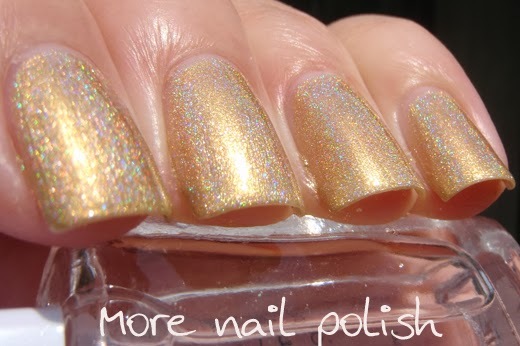 I'm totally amazed at how well you all know your polishes even in a competition that was this hard. Em, you did amazing, so close to the place getters. I just wish I could give you all a prize! I didn't get my entry in on time but I had fun guessing anyway!! Thanks for the fun game! I'll try and enter on time next time. Congrats to the winners! I really wanted to participate but I knew it was going to be a LOT of work (looking at the answers now, I don't know if I would have got any of them right), and it was just the wrong time for me. I would love to try it next time! This was really fun and challenging!! Congrats to the winners! !